Marty Kaiser has spent a lot of time in newsrooms. His interest in journalism began as a child and he chased it through college before joining the Chicago Sun-Times and the Baltimore Sun. His longest tenure, however, was as editor of the Milwaukee Journal Sentinel, where he spent 18 years before retiring in 2015. During his time there, he led reporters to three Pulitzer Prizes and dozens of other national awards. Now, he’s a media consultant and senior fellow at the Democracy Fund. He also sits on the board of directors of the Wisconsin Center for Investigative Reporting and on the advisory boards of the UW-Madison Center for Journalism Ethics, the New England Center for Investigative Reporting and Marquette University’s O’Brien Fellowship. 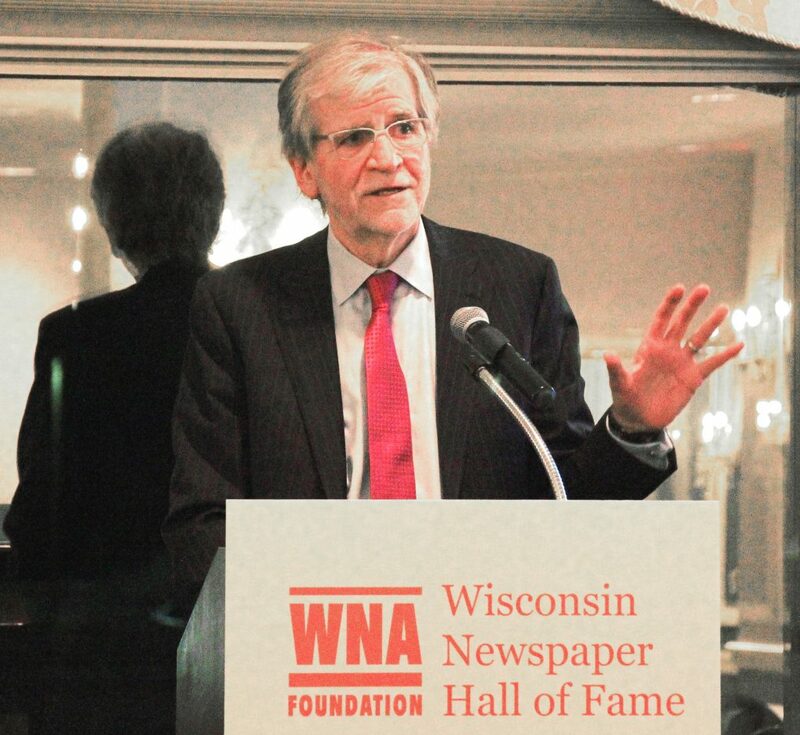 For his decades-long devotion to newspapers and the pursuit of truth, he was honored Nov. 16 as the 50th inductee to the Wisconsin Newspaper Association’s Hall of Fame. What are the most memorable moments of your career? Kaiser: It’s always about the people you work with. I never felt I was the smartest or best in the room but I was able to put good people together and got to work with them. The best journalists are always curious and asking questions and want to expose things, so I figured if I could surround myself with those people — because I wasn’t the best reporter or writer — it would be great. What are some early ethical issues you encountered? Kaiser: I think something everyone goes through is understanding relationships with sources when you’re working on stories. What’s the motivation of the source? Why are they telling you things? I love the old line ‘If your mother says she loves you, check it out.’ Because you can really get caught up in the beginning when [a source] is telling you things and you’re getting great stuff and you’re close to them. But you need to ask why they’re telling you things and how can you find other perspectives to share about what’s going on. And then also there’s dealing with anonymous sources and what the rules are for when someone says to you, ‘Let’s go off the record’ — does that mean I can use this? Is it just on background? And have you pressed them hard enough [to stay on the record]? Also, there’s the point where you have to be understanding of those who don’t deal with the press often. Do they understand what’s going on because you have to protect victims? A big part of journalism is minimizing harm. What are the common ethical challenges journalists face today? Kaiser: Being careful about conflicts of interest: What are the personal relationships [reporters] have with people they cover? And what what you’ve got to remember and keep remembering over and over is what journalism is about. It’s about truth. It’s about verification. Ethics has to encourage humility and understanding. How have journalism ethics changed over the years? Kaiser: I think a lot about the growth of talk radio, which isn’t based on the need for verification but it’s based on an opinion and then going out to find some facts that support that opinion. It’s not saying ‘Hey, I have some questions. Let’s see where the truth leads me.’ And now, this has spilled into cable television where there’s so little reporting — they’re always talking about other people’s reporting or talking heads who have no firsthand knowledge and have done no reporting. They’re only on to promote some industry or political party. Journalists have to be independent and free from political parties, independent from the people they cover. This has all really blurred the line of what is journalism. I think a lot of these people have done a tremendous disservice to democracy. Essentially, those people are entertainers. It’s all about ratings and entertainment. They blur the line. There’s also the growth of nonprofit journalism and the importance of transparency. Some of these groups completely hide where their money is coming from. How has technology impacted journalism and journalism ethics? Kaiser: We now have the urge to to publish first and get it out there. I can remember when there would be discussions about how we would cover something and lots of discussion about how were were going to collect the information and how we were going to cover something and how it was going to be written. Going over who are the stakeholders. Who are we going to speak to? But now, there’s this rush to get stuff online [and] it’s a detriment. But, we can’t blame technology for that. Another thing that really bothers me is on Twitter when a major news organization will tweet out a quote from someone prominent but there’s no context to it. There’s no view from the other side, there’s no reporting on it. You’d never just put a quote like that in a newspaper without adding some context to it. That doesn’t mean you shouldn’t report it. It just means you’ve got to put it in context and understand it. What are the ethical issues that editors face? Kaiser: You’ve really got to think like the reader. And also, some of the toughest ethical questions are ‘Do we have enough and are we ready to publish this?’ The reputation of the news organization could be on the line. There’s nothing wrong with walking through the process and being as skeptical as possible. What do we have? Where did we get it? Why do we have it? Then also asking how many sources you have on a story as well. What’s your advice for new journalists? Kaiser: Have lots of discussions with your colleagues. I always thought the best newsrooms were where they were talking about journalism and where it was open for reporters to ask questions. Think about the people you’re covering and the motives behind what they’re doing. Always come back to your curiousity. And ask your sources who else you should be talking to. Every journalist has to have a personal conscience. Understand that you have to be accountable and transparent in the work that you do. If an ethical error is made, what should be done? Kaiser: Make a correction as quickly as possible. Talk to the people involved in it. Show your transparency. Human beings are flawed. We’re going to make mistakes. I used to talk to readers constantly and, most times, they would understand if you had an honest conversation with them. Tell them that you made a mistake and how it happened.